But neither arrest nor movement. — T. S. Eliot. Pierre-August Renoir. Portrait of Nini Lopez. 1876. Click to zoom in. The more I look at this painting, the more perfect it becomes. It is a paradox, because you cannot improve on perfection, can you? The painting probably stays the same, but the process of seeing draws me into its perfect stillness. There are two realities in any painting: its own material presence, lumps (or glazes) of paint on a two-dimensional surface, and the illusion it creates in the mind’s eye. And a portrait has two things on its to-do list: it represents an individual human being, and also, as any painting, it changes the spectator’s inner state. Rembrandt van Rijn. 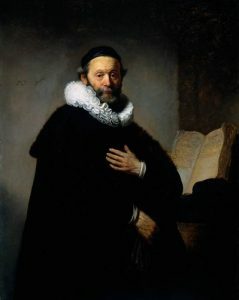 Portrait of Johannes Wtenbogaert. 1633. Traditionally, a portrait would strive to give the spectator’s eyes and brain enough visual clues to create the illusion of seeing a real human being (not just brushstrokes and colour areas). Given this input, the human brain would, consciously or unconsciously, use the same interpersonal skills as it does in real life to “read” the sitter’s mood and personality (and sometimes their social role as well). The craft of realism in portraiture can be understood as the painter’s ability to make this illusion so convincing as to almost dissolve the material reality of painting, so that the spectator ceases to perceive its presence and finds themselves in front of another human being. In this portrait by Rembrandt, for example, it is primarily through our imaginary human connection to this illusion of a man behind the picture plane that the painting works. This is not to say that this painting is anything short of perfect in its painterly qualities, simply that this illusion of human connection is its major pathway into the inner space of the spectator. Pablo Picasso. Portrait of Daniel-Henry Kahnweiler. 1910. The last century saw the emergence of paintings that were very much concerned with their own presence, and so a new kind of portraiture came into existence, which utterly denies the spectator’s brain its familiar visual clues. 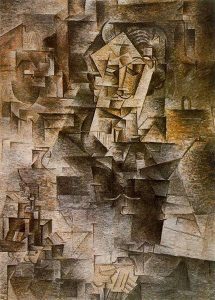 Pablo Picasso, for one, would recreate his sitters in entirely novel, idiosyncratic ways, which would render any real-life interpersonal skills useless and thus challenge the spectator to seek new ways of engaging with the material essence of painting, perhaps to see something beyond the conventional visual reality. It is through its abstract, painterly qualities that this painting finds its way into the inner space of the spectator. Renoir’s portrait of Nini Lopez lies on a unique point on this stylistic arc, a point where the material presence of a painting and the illusionary reality it creates in the mind’s eye are in perfect balance. One can see the girl and the painting at the same time. It is a still point: neither flesh, nor fleshless; just the barely perceptible dance of perception between the two modes of seeing (if you click through to the Google Cultural Institute reproduction, you can make these shifts more evident and controllable by zooming in and out). As long as you see the girl, the painting “works” as a realistic portrait: the brain tries to read her emotions, sense her mood, perhaps even intuit her thoughts. 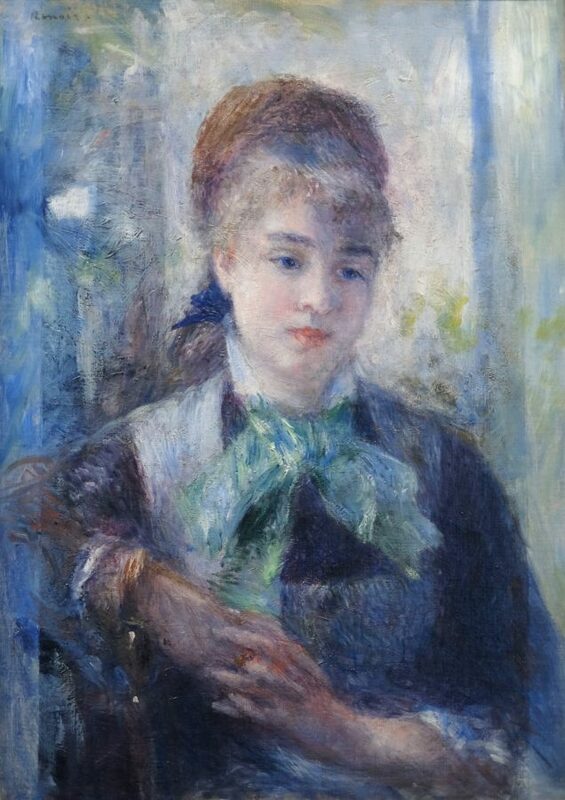 But even as it happens, we are still aware that the girl isn’t really there — it’s the spectator’s own brain, their mind’s eye, that recreates her, here and now, out of Renoir’s brushwork and colour. There is no boundary, no difference between her inner space and ours — it is the same space. And this shared space is also filled with stillness. It is there in her facial expression, the gesture of her hands, her relaxed pose; and it is there in the abstract qualities of the painting: its blue-green colour harmony, the gentle rhythm of its verticals, the nearly perfect symmetry of its dark and light areas. And it is there in the peaceful, harmonious unity between the girl and her environment: the cold light paints her white collar blue and makes her cheeks pale, and, in return, she radiates her warmth into it (have you noticed the yellow-green brushstrokes, as though floating in the air around her?). The stylistic balance between two modes of perception, in itself, is not unique to this painting — it belongs to the age. Nor is this painting unique in depicting a human being so fully immersed in their aloneness, so still in their silent reverie. But here the style and the inner meaning (for lack of a better term) are perfectly aligned. This complete alignment is what makes the painting so impeccably perfect: it depicts stillness, and embodies stillness, and it draws the spectator into its space of stillness.